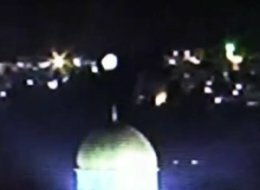 Dueling clips of a purported UFO hovering over Dome of the Rock, an Islamic shrine, on Jerusalem's Temple Mount, have created an online ruckus since surfacing online. Not surprisingly, AOL is reporting on the blogosphere's ongoing debate over the legitimacy of the videos, which show round, bright objects hovering over the landmark's iconic dome before rocketing upwards. The videos, which include audio of the inspired reactions of spectators, were reportedly shot over the weekend.